We've got a lot of holiday cheer around here! Come check out our new Christmas scents! 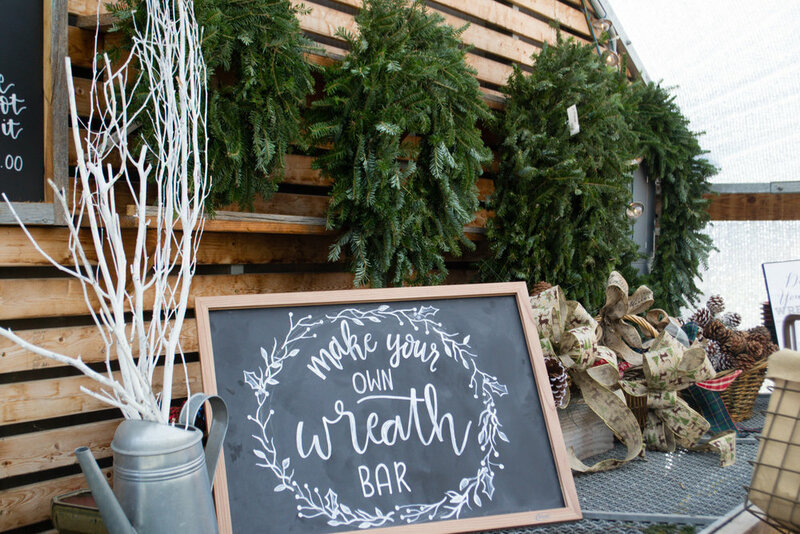 Decorate your own wreath at our Wreath Bar! We handmade all of our wreaths in house & you can decorate with a variety of bows, pine cones, ornaments & accessories! Looking for a venue for your wedding, bridal shower, baby shower or birthday party? Fraser Fir Trees - Our trees come from one of the best tree farms in North Carolina! Come tag yours today! Tree stands available. This year we are fully stocked with a variety of garland to adorn your front porch! Evergreen Wreaths - Handmade in house, our evergreen wreaths are made with fresh Maine greens! Available in 3 sizes! Boxwood Wreaths - Adorn your front door with a 10" boxwood wreath and a simple red bow! Evergreen Garland - Available in 25', 50' and 75' in a variety of evergreen, boxwood & boxwood mix. Evergreen Swags - Available with a classic red bow or pine cones! Grave Blankets - Available in two sizes, made with a wooden base and fresh evergreen. Looking for a fun, holiday activity? Come decorate your own fresh evergreen wreath! Available in 3 sizes, pick a wreath, choose from our selection of handmade bows, ornaments & seasonal accessories and decorate! The DECORATE-YOUR-OWN Wreath Bar is open in our greenhouse, during operating hours. We're open 9-6pm Mon-Sat, 12-4pm Sun. Evergreen Giftables - Hand made with fresh evergreen from Maine & boxes made of local barn wood! Your favorite treat is back this season! While you browse our uniquely decorated wreaths and beautiful Fraser Fir Christmas trees, make sure to pop in the back greenhouse for a FREE hot cocoa (or coffee) and some treats! We keep our bar freshly stocked with the yummiest cookies & candy canes, sure to make your trip to Bast Brothers this season extra special! We're closing for the season on Saturday, December 23rd & reopening Friday, March 23rd for the Spring Season! See you then! Follow us on Instagram and Facebook to see sneak peeks of what we have in store! Receive a 10% off coupon just for signing up with your email address!